When it comes to interpreting lots of data, I prefer visuals. The following two graphs represent almost ten years of data from my monthly cell phone bills, dating back to the summer of 2001. I’m sure that there are all sorts of correlations that could be made from this data, but the first thing I saw besides the frenzy of college were relationships. I’m bad at remembering dates, but it’s very clear from looking at the graphs whether or not I was in a relationship. There is a modest increase in calls when you’re interested in someone. Between talking to them and to your friends trying to get their opinion, it makes sense. As does the increase in call duration when you start seeing them regularly. The further away they live, the larger the spikes; if you’re living with someone, more communication is in person. Of course, I look at this in hindsight and wonder what the heck was being said for all those hours. On the other hand, this viewpoint could explain why I’m single. I have one of the cheapest plans available, enough to get me by without incurring additional fees. 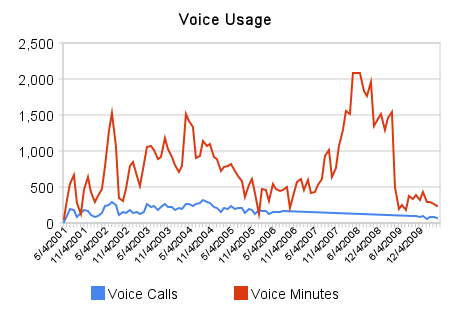 I was surprised how expensive my calls were when averaged out per-minute. 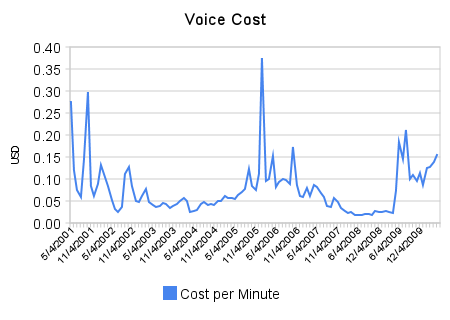 Even when I was talking on the phone a lot, the per minute cost was still relatively high. I remember when phone cards could be used for $0.02 to $0.05 per minute. It occurred to me that we pay a lot for the convenience of not being tied down to a particular location. It would be neat to see if the same trends apply to text messaging. That’s very interesting. I wonder how my usage -vs – cost would plot out…most of the spikes would be overseas calls, and the rest would be pretty low and flat.